Struggling with finding the confidence to use video for your business? We’ve got some playful and powerful strategies for you. Did you know more than 1.9 billion people watch at least one video monthly on YouTube? We also consume an average of 1 billion hours of video per day. These numbers are staggering, and if you haven’t started using video for your business, then episode 7 with Video Strategist Paige Wilhide is for you! Paige has always had a passion for video. She started filming and editing back in the day of VHS (oh my). After college, she moved to Japan to teach where she had a difficult time communicating with her students about her life back in the United States. She soon found she was able to utilize video to help her students understand the cultural nuances. It was then that she truly understood the power of video. What Santa thinks about Paige’s gluten-free cookies. Paige’s start on YouTube in 2009. What to consider when you are the face of your brand. How to move beyond the paralyzation of perfection. Tips for creating a great video with only your phone’s camera. The scripting formula Paige generally recommends when shooting a video. The best strategy for your video’s call to action. How long does it take to move a cold lead to a warm lead via video? The two secrets to building confidence on video! The power of the blooper. Everyday for 10 days, make a video where you give one tip to demonstrate your knowledge. 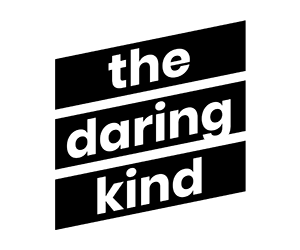 Post on social and tag @TheDaringKind and @PaigeMedia. Paige is a comedian, director, producer, and video strategist who just loves working on all sides of the camera. Right after graduating from University of Maryland, she lived in Japan for a year where she worked as an English teacher and fell in love with storytelling. She moved to New York City in 2011 to pursue her dream of being on Broadway, but her journey quickly took her in another direction. She started producing short-form promotional videos from her 4th floor walk-up apartment, and before she knew it, she had accidentally created a video marketing & production company. As Paige evolved, so did Paige Media. She now lives in Los Angeles, teaching entrepreneurs how to get over their camera fright and build massive online influence. Her signature course Lights, Camera, Crush It is changing the game for entrepreneurs who want to grow their businesses with video. In addition to her obsession with video, Paige also loves doing (and watching) improv comedy, hosting murder mystery parties, and working on her tennis game.